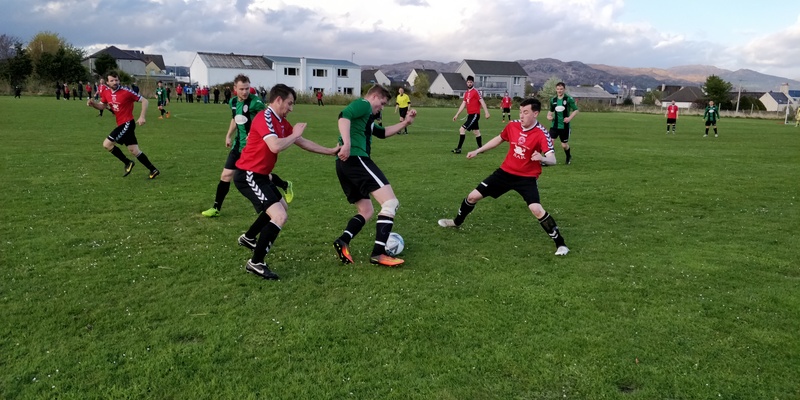 Sleat and Strath striker Josh Knowles shields the ball from Kyleakin defender Alistair Brown during a competitive but goalless encounter. Last season’s champions and this year’s pacesetters earned a point apiece in what was a hard-fought yet entertaining draw in Kyleakin. The opening period proved to be a tight affair with both sides cancelling each another out with some well-organised and resolute defending. Kyleakin forward Gordy McCarroll posed the greatest threat to the Sleat and Strath defence during the first half and went close to scoring inside the opening 20 minutes from a free-kick – but Sleat’s goalkeeper Finlay Burstow read the path of the ball to tip the forward’s curling effort over the bar. A few minutes later McCarroll did manage to find the back of the net, only to see the goal ruled out for offside. Connaire Yoxon, in turn, kept the home side’s backline on its toes during the first period and would go on to be a constant menace throughout the game. The lively playmaker found space down the right before attempting to square the ball to teammate Josh Knowles but was thwarted by the quick-thinking of Craig Wilson in the Kyleakin goal who stifled the danger with a block. Daniel Macinnes flicks on a header as Sleat look to attack down Kyleakin’s right side. 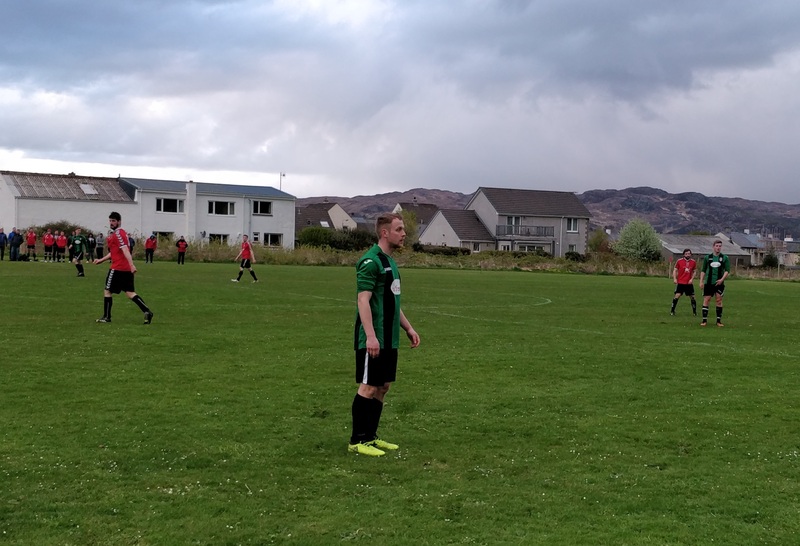 With around half an hour gone, Ben Yoxon broke from midfield and embarked on a fantastic run – slaloming his way past three Kyleakin players – but couldn’t quite get enough on his shot in the end. At the other end, Kyelakin saw an effort cleared off the line before Norman ‘Raasay’ Gillies went close to breaking the deadlock from a corner but his header looped over the bar. The home side were forced to reshuffle the pack before half-time after Oliver Thompson sustained a dislocated finger, with the midfielder being replaced by David Falconer. Former Brora Rangers striker Scott Graham was the focal point for Kyleakin for much of the second half. 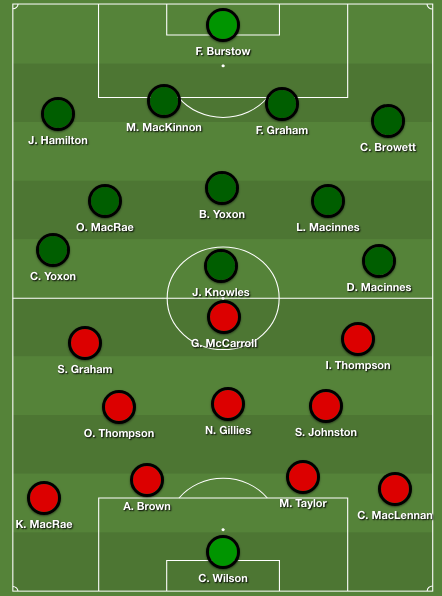 Kyelakin switched to a 4-4-2 formation in the second half, with David Falconer playing left midfield, while Innis Thompson took up the right midfield berth. The enforced change appeared to give the hosts an extra spring in their step as they attacked with more purpose down the left wing. 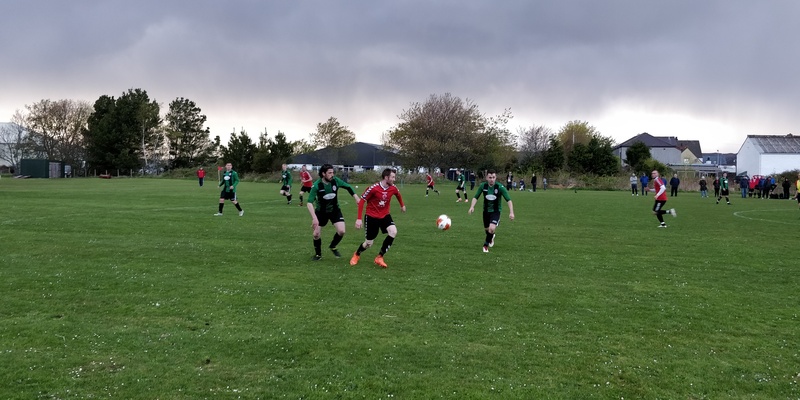 Keith MacRae pushed forward from fullback to create the option of an overlap, as Kyleakin looked to stretch their opponents in the second half. Sleat and Strath were prepared to dig in, however, and looked to exploit the pace and invention of the Yoxon brothers on the break as they sought to support target man Josh Knowles. Indeed, the link-up nearly bore fruit for the visitors ten minutes into the second half when Knowles got the better of the home defence to flick the ball into the path of Connaire Yoxon – but much to the forward’s frustration – Wilson was alerted to the threat and denied the Sleat player. Meanwhile, Scott Graham was beginning to show signs of his calibre as a player, with some neat touches and clever link-up play. The former Highland League striker, nutmegged an opponent one minute, and then knocked on a ball towards Thompson, but the tricky striker couldn’t get his shot off. Lachie Macinnes (Sleat) and Iain ‘Spod’ MacLeod (Kyelakin) tussle for possession during the second half. As the game approached the hour-mark, Connaire Yoxon continued to excel as chief tormentor to the Kyelakin rearguard and went extremely close to putting his side ahead with a fantastic piece of skill. Breaking down the right wing, and having spotted Wilson slightly off his line, he attempted to chip the ball over the home goalkeeper, but despite what was an audacious effort, the ball looped just over the top-left corner. Although both sides defended stubbornly throughout, there was certainly no shortage of opportunities created as the game wore on. 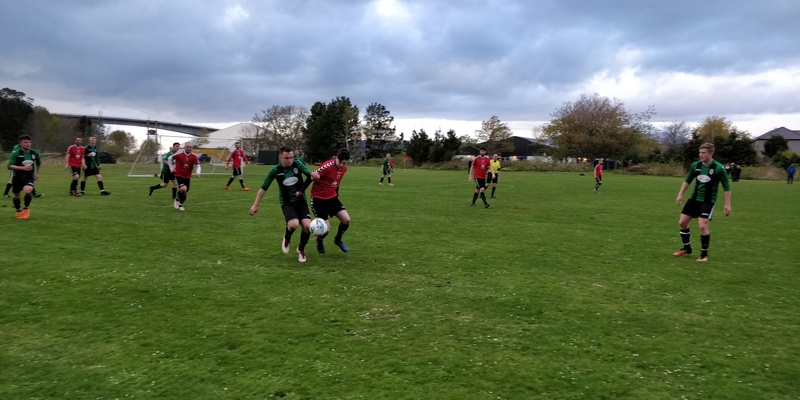 Norman ‘Raasay’ Gillies, who was in the thick of the battle in the centre of midfield for much of the second half, produced a fantastic through-ball after intercepting possession. Unfortunately for Gillies, neither Thompson or Graham could quite get on the end of the pass which would have seen them through on goal. 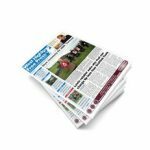 The Kyleakin midfielder then almost went one better as his effort from a corner looked set to evade Burstow, but the crossbar came to the visitors’ rescue to keep the scores level. 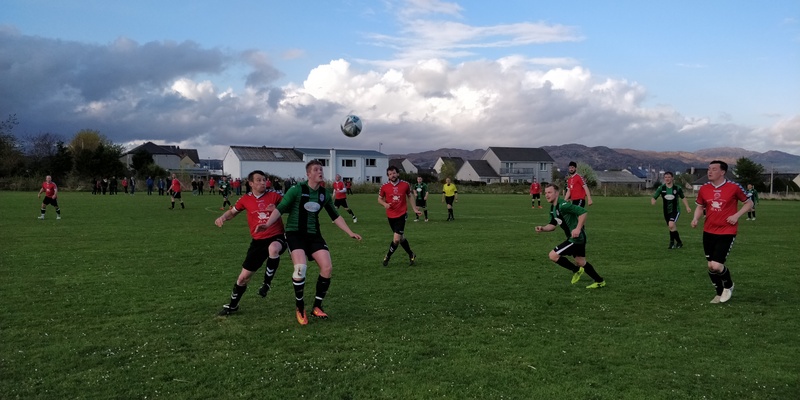 Kyleakin were left frustrated when their claims for handball were waved away by the referee with a quarter of an hour to go. 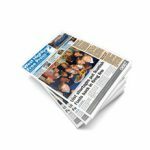 The home side felt that it was clearly a case of ball to hand by Sleat’s Martin MacKinnon, but the referee was unmoved. Josh Knowles (centre) demanded the close attention of the Kyelakin defence during Wednesday’s game. The aforementioned MacKinnon was a solid and formidable presence in what was an impressive display by the visitors’ defensive unit. Jamie Hamilton was another who proved to be a thorn in the home team’s side for most of the second half in particular. The defender’s timely block to deny Scott Graham with less than ten minutes to play, capping off his key role in helping to nullify Kyleakin’s talented attackers. Both sides continued to exert pressure on each other right until the final whistle in the hope of taking advantage of a lapse in concentration or a moment of tiredness. 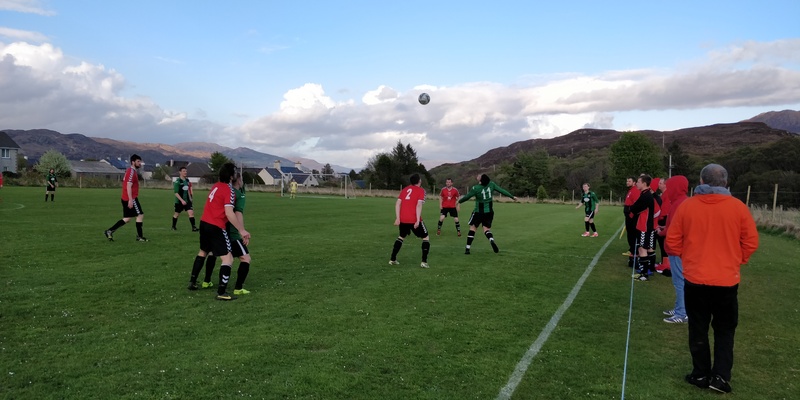 Sleat frontman Knowles looked to latch onto a pass behind the Kyleakin defence with just a few minutes to go but Keith MacRae’s pace and awareness ensured he would be first to the ball and that the points would be evenly shared in the end. Although the Sleat and Strath attacker didn’t manage to unlock the Kyleakin defence – for which they deserve much credit – he did lead the line for DL MacKinnon’s side with his willingness to drive forward and take on players. His chipped effort in the second half would have been a goal worthy of winning any game.